A merciful judge has spared a motoring offender from a driving ban after the defendant claimed it would have destroyed his business and left him in debt. Chesterfield magistrates’ court heard on Tuesday, February 27, how Kurtis Dean Britland, 26, of Main Street, Palterton, was found guilty of failing to give the identity of the driver who was alleged to have committed a motoring offence. Britland, who already has 11 penalty points on his licence, was facing further penalty points that would have exceeded the 12 point limit and would have banned him from the road, according to the court. 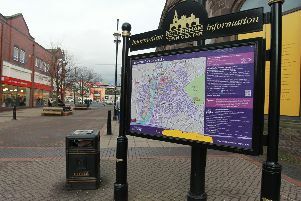 But the defendant argued such a ban would leave him in exceptional hardship because his mobility scooter business, KB Mobility, of Angel Yard, Chesterfield, would be forced to fold and he would be unable to pay back a loan worth thousands of pounds to his parents. Prosecuting solicitor Robert Carr said police had originally investigated a speeding offence and only received a hand-written letter that the vehicle involved had been sold in May by Britland but there was no information about who the new driver was so Britland was convicted in his absence of failing to provide details. The court heard Britland has a previous conviction for not sending a form back with details about another driving offender. However, he told the court he needs to be able to drive his van to take scooters to customers across Derbyshire and to carry out trials and repairs and he would not be able to afford a driver. The court heard Britland has accumulated 11 penalty points including six after his previous conviction for failiing to return a form and provide details and five more points for his own speeding offence. District Judge Andrew Davison said he was satisfied that if Britland lost his driving licence his business would fold. He stated that he felt a driving ban would mean the business would cease to exist and his parents would be left with a significant financial loss. District Judge Davison therefore concluded this would result in exceptional hardship and agreed not to impose a driving ban. However, he still imposed six penalty points without a ban to last until December, 2019, and warned that one more driving offence resulting in further points would mean a disqualification. He fined Britland £750 and ordered him to pay a £75 victim surcharge and £325 costs.